Hypertension is a disorder characterized by consistently high blood pressure. Blood pressure readings are given as two numbers. The top number is called systolic blood pressure, and it represents the pressure generated when the heart beats. The bottom number is called diastolic blood pressure, and it represents the pressure in the vessels when the heart is at rest. 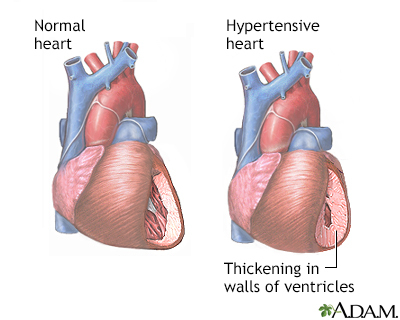 Persistent high blood pressure can lead to abnormal changes in the heart.